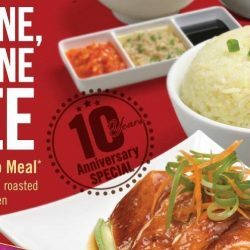 Celebrate The Chicken Rice Shop's 10th Anniversary with their 1-for-1 Single Combo Meal every 10th of each month till 10 June 2017! 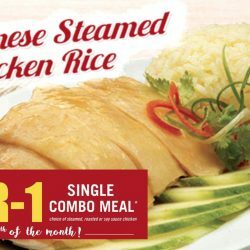 Don’t miss out on your Single Combo Meal treat at OneKM (#02-17/18) or Causeway Point (#B1-16)! Don’t miss out on your Single Combo Meal treat this Thursday, 10 November at OneKM (#02-17/18) or Causeway Point (#B1-16)!